Informed by the Cambridge Learner Corpus, and providing an official past exam paper, Complete PET is the most authentic exam preparation course available. Each unit of the Student's Book covers one part of each exam paper and provides thorough exam practice. Grammar and vocabulary exercises target areas that cause problems for candidates, based on data from the Cambridge Learner Corpus, taken from real exam scripts. The CD-ROM provides additional exam-style practice (audio available separately or as part of the 'Student's Book Pack'). 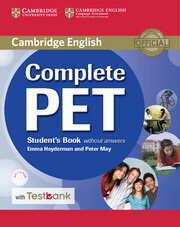 A Testbank access code for four online Cambridge English: Preliminary practice tests is included with this Student's Book. 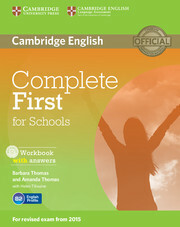 Complete First for Schools is official preparation for the revised 2015 Cambridge English: First (FCE) for Schools exam.